For any business to truly minimize its tax burden, all possible incentives and strategies must be considered. Capital Review Group’s proven Capital Discovery® process is a unique holistic approach that combines specialized technical knowledge with a thorough understanding of tax law to yield immediate and dramatic financial benefits for our clients. Developed over years of acquiring in-depth knowledge of incentives and the tax code, our team of experts has refined and advanced Capital Discovery, transforming it into a powerful tool for business taxpayers and their tax or financial advisors. The R&D Tax Credit, which many businesses wrongly assume is only available to large corporations or those engaged in high-tech or scientific research. In reality, the R&D Credit represents an opportunity for substantial tax savings for businesses of all sizes in a wide variety of industries. This valuable incentive was recently made a permanent part of the tax code and expanded for the benefit of small and medium-sized businesses. Sales tax review, a strategy that can help businesses–particularly those that sell goods out of state–identify and recover money lost through overpayment of sales and use taxes. The Work Opportunity Tax Credit (WOTC), which provides employers with a tax credit of up to $9,600 for each worker hired from a target group. Cost segregation, a powerful tax strategy that enables commercial building owners to seize more substantial and immediate deductions by simply reclassifying certain real property assets as tangible personal property. These are just a few examples of the tax incentives and strategies that we may capture for our clients using Capital Discovery. We customize our approach in order to maximize savings for each client in light of their particular circumstances. 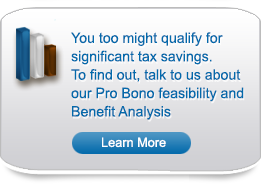 Contact CRG to schedule a pro bono analysis and find out how Capital Discovery can help you! Do you have a question we can help with?